Our last post was the first step to lawn recovery. We discussed how aeration & fertilization of your lawn would help you recover some beauty to your lawn. In this post, the lawn recovery procedure program is continued with two other steps. We first aerated the lawn to loosen up the soil. Then we fertilized the lawn to promote good root growth. We also used some Milorganite with the starter fertilizer to help out as well. Then we planted some seed that went with the region you are in such as warm or cool season areas. If you have a weed problem you want to also do some weed control. 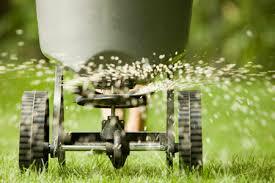 There are some starter fertilizers that have weed control ingredients already in them. These last two steps are done to increase the results of your lawn. It is pretty much just adding more fertilizer, particularly a winterize fertilizer at a stronger dosage of application which is around 15lbs to 1000 sq. ft. These two steps are pretty much identical except for the timing of the applications. The 2nd step is applied October while the 3rd step is applied in November. In October there is still a chance of it getting warm and could produce some grass growth that can do away with some of the fertilizer. In November the chances of it warming up and the grass growth has a less chance of happening. The end result is that you will be nourishing your yard during the winter months thus increasing better grass results when the Spring arrives. For a great overview see the video below. Thanks for visiting in with us and I hope this post was helpful. 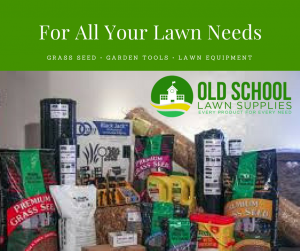 You can pick up all your lawn needs at our store www.oldschoollawnsuplies.store. Please feel free to leave any questions or comments in the comments section below. Timing is everything I see. Very good information. I enjoy the fact that you lay it all out in layman’s terms so that it is easier to understand. Nicely done. Thank you. I try to share all information that I can to homeowners because it is good to know what makes your lawn look its best. A lot of times that is all it takes for someone to actually do a little yard maintenance. If you don’t know you won’t try. Thanks for the tips, you really think about all the factors quite well when it comes to repairing and maintaining your lawn! I am glad I stumbled upon your helpful tips. The improvements that these products bring to your lawn are quite impressive I must say. Yes, it really does. Our lawns need our help in order for them to look their best. They can by nature look decent but our help makes them look very well. You make this entire process so simple. Before reading your post, I was ready to pay someone to do this. I think that between my son and myself, we can make our lawn ready for Spring. I am glad I found this informative post, thanks for sharing with us. You are welcome. This will make me so happy to know that all you needed was information to help you save some money. That is the whole reason I post these tips. I know that most people don’t try because they don’t know where to start because of lack of knowledge. I would love to know how you two worked it out on your own. I am very happy you are willing to try it. Wish you well. I need to get rid of those weeds! Clearly, I’m not good at all with lawn care as I’ve tried different things to get rid of the weeds. I even made an attempt to manually pull them out one at a time. This was a major failure and lost lots of time. Sounds like I may need to restart everything next summer? Advice? That is okay. You are not the only one. Try clicking here to read an article on fighting weeds. I hope this helps. Any idea where is the best place I can get the winterize fertilizer you mentioned? Sure. You can go to your local lawn & garden store or you can go to the store associated with this site which is Old School Lawn Supplies.